Finding the right partner to help you create the perfect lawn in Lewis County is not always easy. There are dozens of landscaping companies out there, and you need one with expertise in lawn maintenance and the highest quality products. At Country Green Turf Farms, we understand that you’re not an expert in planting and maintaining a lawn, but we are. We have a variety of seed products to plant beautiful turfgrass, including seed mixtures for every type of growing situation, as well as fertilizers, and hydroseeding installation. We can help you discover exactly what you need to make your lawn thrive in Lewis County. 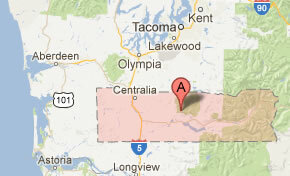 Whether you live in Centralia or in another area of Lewis County, we can help you get the right products for your turf. In addition to providing you with the seed or sod to get you started on your new lawn, we have the supplies to keep your lawn looking great year after year. We offer fertilizer, equipment to keep your lawn watered and properly cared for, erosion prevention tools, contractor services, and even expert consultants who can provide you with information about creating and maintaining the best lawn.